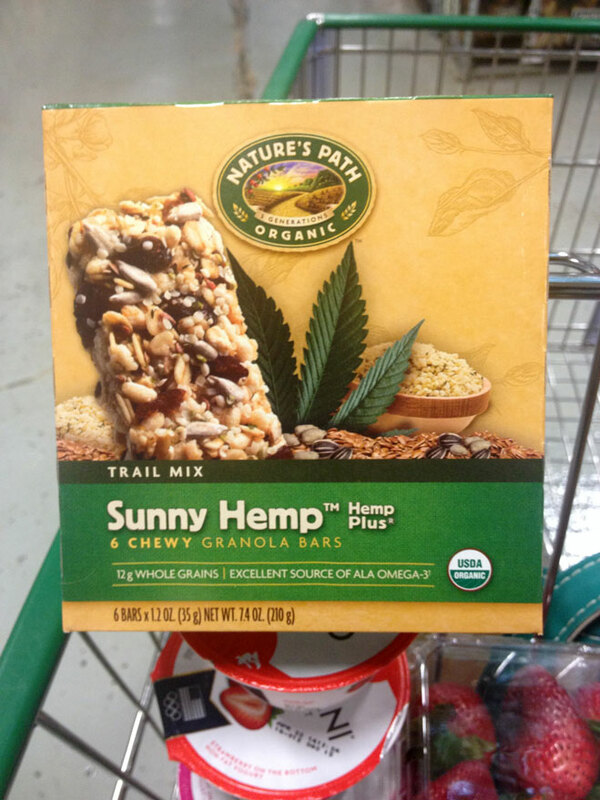 Despite the obvious Cannabis leaf on the package which suggests otherwise, Sunny Hemp granola bars by Nature’s Path don’t contain any psychoactive ingredients. Sorry to harsh your mellow. Industrial hemp, the kind grown for seeds, oils, fibers, etc, is known as Cannabis Sativa L. Cannabis cultivated for medicinal or recreational use, on the other hand, is known as Cannabis Indica (more commonly referred to as “marijuana”). This variety is bred specifically for its flowers, and THC (Tetrahydrocannabinol – the psychoactive substance that produces the “high”). Hemp grown industrially is heavily regulated…and is required to have less than a 0.03% THC content. This is different from marijuana, which often has 7 to 20% (or more) THC present. Comparing hemp to marijuana is really like comparing a Brussels sprout to a rutabaga – they may belong to the same family, but they’re completely different! If you’d like to try hemp granola bars (perhaps to satisfy a case of the “munchies”), you could make your own using the recipe at My New Roots or you can order some of the packaged ones HERE.